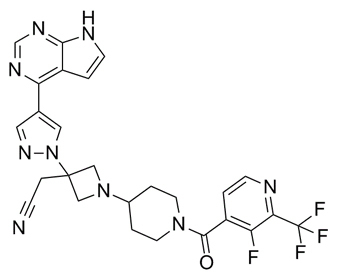 Itacitinib, also known as INCB39110 or INCB039110, is a potent JAK1 tyrosine kinase inhibitor, which is currently in Phase II trials for the treatment of rheumatoid arthritis, myelofibrosis, rheumatoid arthritis and plaque psoriasis. INCB039110 produced significant improvements in sPGA, demonstrating proof of concept in chronic plaque psoriasis.
. Mascarenhas JO, et al. Primary analysis of a phase II open-label trial of INCB039110, a selective JAK1 inhibitor, in patients with myelofibrosis. Haematologica. 2017 Feb;102(2):327-335.